Rebecca Connew makes up the other half of the ‘Connew Connection’ at CrossFit 3216. Originally from Northland, Rebecca has a long sporting background in competitive equestrian pursuits and representative hockey at secondary school level. The electrical services Project Engineer has also turned her hand at mountain biking, touch and lacrosse amongst other sports. Rebecca was introduced to CrossFit by her husband James over 5 years ago now trying the odd “Girls” WOD as part of their ‘Globo’ gym routine. Eventually these ‘freestyle’ workouts spilled out into the family backyard as there was no established CrossFit affiliate in Hamilton in those days. But when there was Rebecca along with James, was one of the first affiliated CrossFit members in Hamilton. 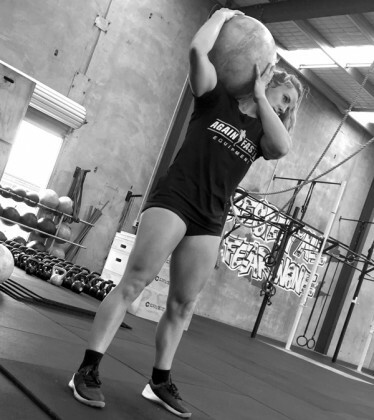 Fast forward a few years and Rebecca is now a 3 time Pacific Regionals CrossFit athlete and has competed at many of the premier CrossFit comps in the Australasian region. She certainly knows what it takes to be a consistent performer at the top level in our region. Rebecca has really enjoyed the new challenge of coaching. Having been in the competitive arena for so long it was a natural progression to make. Rebecca finds coaching rewarding especially helping others to move better to allow them to get more out of their workouts but it has also revived some aspects of her own training. Rebecca brings a wide spectrum of skill and experience as an athlete to CrossFit 3216. Aside from competing and coaching Rebecca loves the community and friendships CrossFit has built by bringing like-minded people together. There is something about “getting a big sweat up, having a good laugh, telling some sweet yarns and going out and eating some delicious food and not feeling guilty” that brings people together, she says.